The MAX8556 MAX8557 low-dropout linear Regulators operate from input voltages as low as 1.425V and are able to deliver up to 4A of continuous output current with a typical dropout voltage of only 100mV. The output voltage is adjustable from 0.5V to VIN - 0.2V. 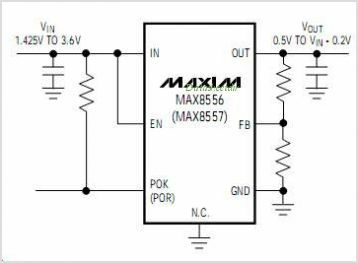 Designed with an internal P-Channel MOSFET pass Transistor the MAX8556 MAX8557 maintain a low 800A typical supply current, independent of the load current and dropout voltage. Using a P-Channel MOSFET eliminates the need for an additional external supply or a noisy internal Charge Pump Other features include a logic-controlled shutdown mode, built-in soft-start, short-circuit protection with foldback current limit, and thermal-overload protection. The MAX8556 features a POK output that transitions high when the Regulator output is within 10% of its nominal output voltage. The MAX8557 offers a power-on reset output that transitions high 140ms after the output has achieved 90% of its nominal output voltage. 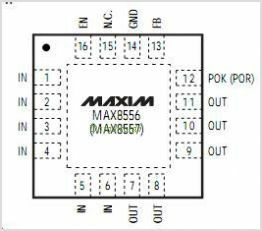 The MAX8556 MAX8557 are available in a 16-pin thin QFN 5mm x 5mm package with exposed paddle. This is one package pinout of MAX8557,If you need more pinouts please download MAX8557's pdf datasheet. This is one application circuit of MAX8557,If you need more circuits,please download MAX8557's pdf datasheet.